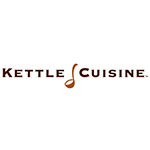 Kettle Cuisine | Favorite Foods, Inc. Founded just outside of Boston in 1986, Kettle Cuisine handcrafts fresh, premium soups, sauces, sides, entrees, sous vide meats, glace, demi-glace and broth concentrates for foodservice operators and grocery retailers who take pride in the food they share with their guests. Sourcing only the finest ingredients from trusted purveyors, we cook the traditional way, using artisan techniques that honor each ingredient, building flavor slowly for an unforgettable taste.